[Laz Ude Eze]: Adieu Professor Dora Akunyili – Good Person, Great Woman! I had to wait for 24hrs to see if the story of your death will be refuted but obviously it’s now a sad reality one must accept. I received the news with mixed feelings; saddened that we lost you at this trying time in our nation’s history – a time strong patriotic voices like yours is needed. Pained that we can’t have a “Senator Dora” who would have pushed for a legislation that would provide appropriate punishment for killers who deal in fake drugs; and other policies that will strengthen our health system. At same time, I’m glad that in your life time, you demonstrated integrity, passion, courage and patriotism in discharging your national assignments. Your commitment to positive change was incredibly admirable. We may not be able to quantify the many lives you and your team in NAFDAC saved. Coming to the National Conference to contribute, for the last time, to national development was also a notable move. I’m glad you’re a role model to many young women and men who want to make positive impact in this country. You are one of those who have proven that public office is not only for the bad guys and don’t always corrupt good people. A couple of years ago, I asked my fiancee who her role model in public service was, she mentioned your name. We both share deep sense of personal loss in your demise. Just as I met and saluted Madam Oby Ezekwesili recently for her courage and patriotism, I looked forward to meeting you to tell you how much of an inspiration you have been to me and many other Nigerians. Alas…that day never came. 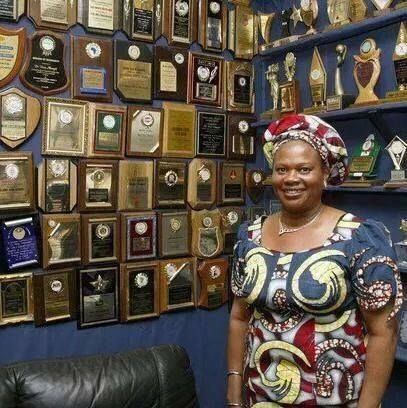 This photo says it all; even public officers who purchase awards haven’t been able to get this many. You fought hard to remain here with us, but perhaps our creator needs you at his right hand side this time. God bless your soul, Dora. And may God strengthen your husband and my senior colleague – Dr Chike Akunyili, your children and all your loved ones this difficult time. With tears in my eyes, I celebrate you. Adieu Professor Dora Akunyili – Good Person, Great Woman! !